Additions to the Antarctic Treaty are known as "protocols", they are usually named after the place where they were signed. 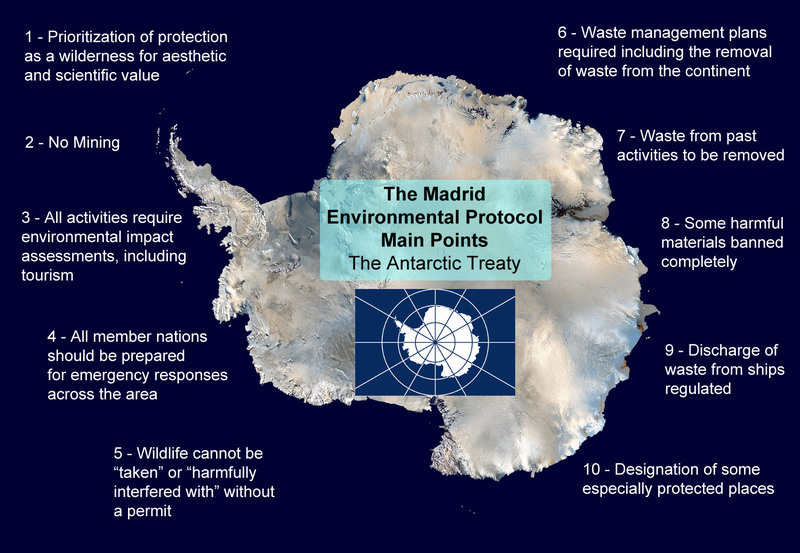 The most significant was signed in Madrid in 1991 therefore being known as the Madrid Protocol, though it's official title is, "The Protocol on Environmental Protection to the Antarctic Treaty". The Antarctic Treaty Nations agreed on this protocol in 1991, it came into force in 1998. (g) "Committee" means the Committee for Environmental Protection established in accordance with Article 11. The Parties commit themselves to the comprehensive protection of the Antarctic environment and dependent and associated ecosystems and hereby designate Antarctica as a natural reserve, devoted to peace and science. 1 - The protection of the Antarctic environment and dependent and associated ecosystems and the intrinsic value of Antarctica, including its wilderness and aesthetic values and its value as an area for the conduct of scientific research, in particular research essential to understanding the global environment, shall be fundamental considerations in the planning and conduct of all activities in the Antarctic Treaty area. (e) regular and effective monitoring shall take place to facilitate early detection of the possible unforeseen effects of activities carried on both within and outside the Antarctic Treaty area on the Antarctic environment and dependent and associated ecosystems. 3 - Activities shall be planned and conducted in the Antarctic Treaty area so as to accord priority to scientific research and to preserve the value of Antarctica as an area for the conduct of such research, including research essential to understanding the global environment. (b) be modified, suspended or cancelled if they result in or threaten to result in impacts upon the Antarctic environment or dependent or associated ecosystems inconsistent with those principles. 1 - This Protocol shall supplement the Antarctic Treaty and shall neither modify nor amend that Treaty. 2 - Nothing in this Protocol shall derogate from the rights and obligations of the Parties to this Protocol under the other international instruments in force within the Antarctic Treaty system. The Parties shall consult and co-operate with the Contracting Parties to the other international instruments in force within the Antarctic Treaty system and their respective institutions with a view to ensuring the achievement of the objectives and principles of this Protocol and avoiding any interference with the achievement of the objectives and principles of those instruments or any inconsistency between the implementation of those instruments and of this Protocol. (f) carry out such steps as may be agreed upon at Antarctic Treaty Consultative Meetings. 2 - Each Party undertakes, to the extent possible, to share information that may be helpful to other Parties in planning and conducting their activities in the Antarctic Treaty area, with a view to the protection of the Antarctic environment and dependent and associated ecosystems. 3 - The Parties shall co-operate with those Parties which may exercise jurisdiction in areas adjacent to the Antarctic Treaty area with a view to ensuring that activities in the Antarctic Treaty area do not have adverse environmental impacts on those areas. Any activity relating to mineral resources, other than scientific research, shall be prohibited. (c) more than a minor or transitory impact. 2 - Each Party shall ensure that the assessment procedures set out in Annex I are applied in the planning processes leading to decisions about any activities undertaken in the Antarctic Treaty area pursuant to scientific research programs, tourism and all other governmental and non-governmental activities in the Antarctic Treaty area for which advance notice is required under Article VII (5) of the Antarctic Treaty, including associated logistic support activities. 3 - The assessment procedures set out in Annex I shall apply to any change in an activity whether the change arises from an increase or decrease in the intensity of an existing activity, from the addition of an activity, the decommissioning of a facility, or otherwise. 4 - Where activities are planned jointly by more than one Party, the Parties involved shall nominate one of their number to co-ordinate the implementation of the environmental impact assessment procedures set out in Annex I. 1 - The Annexes to this Protocol shall form an integral part thereof. 2 - Annexes, additional to Annexes I-IV, may be adopted and become effective in accordance with Article IX of the Antarctic Treaty. 4 - Annexes and any amendments and modifications thereto which have become effective in accordance with paragraphs 2 and 3 above shall, unless an Annex itself provides otherwise in respect of the entry into effect of any amendment or modification thereto, become effective for a Contracting Party to the Antarctic Treaty which is not an Antarctic Treaty Consultative Party, or which was not an Antarctic Treaty Consultative Party at the time of the adoption, when notice of approval of that Contracting Party has been received by the Depositary. 5 - Annexes shall, except to the extent that an Annex provides otherwise, be subject to the procedures for dispute settlement set out in Articles 18 to 20. (b) adopt measures under Article IX of the Antarctic Treaty for the implementation of this Protocol. 2 - Antarctic Treaty Consultative Meetings shall review the work of the Committee and shall draw fully upon its advice and recommendations in carrying out the tasks referred to in paragraph 1 above, as well as upon the advice of the Scientific Committee on Antarctic Research. 1 - There is hereby established the Committee for Environmental Protection. 2 - Each Party shall be entitled to be a member of the Committee and to appoint a representative who may be accompanied by experts and advisers. 3 - Observer status in the Committee shall be open to any Contracting Party to the Antarctic Treaty which is not a Party to this Protocol. 4 - The Committee shall invite the President of the Scientific Committee on Antarctic Research and the Chairman of the Scientific Committee for the Conservation of Antarctic Marine Living Resources to participate as observers at its sessions. The Committee may also, with the approval of the Antarctic Treaty Consultative Meeting, invite such other relevant scientific, environmental and technical organisations which can contribute to its work to participate as observers at its sessions. 5 - The Committee shall present a report on each of its sessions to the Antarctic Treaty Consultative Meeting. The report shall cover all matters considered at the session and shall reflect the views expressed. The report shall be circulated to the Parties and to observers attending the session, and shall thereupon be made publicly available. 6 - The Committee shall adopt its rules of procedure which shall be subject to approval by the Antarctic Treaty Consultative Meeting. (k) the need for scientific research, including environmental monitoring, related to the implementation of this Protocol. 2 - In carrying out its functions, the Committee shall, as appropriate, consult with the Scientific Committee on Antarctic Research, the Scientific Committee for the Conservation of Antarctic Marine Living Resources and other relevant scientific, environmental and technical organisations. 1 - Each Party shall take appropriate measures within its competence, including the adoption of laws and regulations, administrative actions and enforcement measures, to ensure compliance with this Protocol. 2 - Each Party shall exert appropriate efforts, consistent with the Charter of the United Nations, to the end that no one engages in any activity contrary to this Protocol. 3 - Each Party shall notify all other Parties of the measures it takes pursuant to paragraphs 1 and 2 above. 4 - Each Party shall draw the attention of all other Parties to any activity which in its opinion affects the implementation of the objectives and principles of this Protocol . 5 - The Antarctic Treaty Consultative Meetings shall draw the attention of any State which is not a Party to this Protocol to any activity undertaken by that State, its agencies, instrumentalities, natural or juridical persons, ships, aircraft or other means of transport which affects the implementation of the objectives and principles of this Protocol. 1 - In order to promote the protection of the Antarctic environment and dependent and associated ecosystems, and to ensure compliance with this Protocol, the Antarctic Treaty Consultative Parties shall arrange, individually or collectively, for inspections by observers to be made in accordance with Article VII of the Antarctic Treaty. (b) any observers designated at Antarctic Treaty Consultative Meetings to carry out inspections under procedures to be established by an Antarctic Treaty Consultative Meeting. 3 - Parties shall co-operate fully with observers undertaking inspections, and shall ensure that during inspections, observers are given access to all parts of stations, installations, equipment, ships and aircraft open to inspection under Article VII (3) of the Antarctic Treaty, as well as to all records maintained thereon which are called for pursuant to this Protocol. 4 - Reports of inspections shall be sent to the Parties whose stations, installations, equipment, ships or aircraft are covered by the reports. After those Parties have been given the opportunity to comment, the reports and any comments thereon shall be circulated to all the Parties and to the Committee, considered at Antarctic Treaty Consultative Meeting, and thereafter made publicly available. (b) establish contingency plans for response to incidents with potential adverse effects on the Antarctic environment or dependent and associated ecosystems. (b) establish procedures for immediate notification of, and co-operative response to, environmental emergencies. 3 - In the implementation of this Article, the Parties shall draw upon the advice of the appropriate international organisations. Consistent with the objectives of this Protocol for the comprehensive protection of the Antarctic environment and dependent and associated ecosystems, the Parties undertake to elaborate rules and procedures relating to liability for damage arising from activities taking place in the Antarctic Treaty area and covered by this Protocol. Those rules and procedures shall be included in one or more Annexes to be adopted in accordance with Article 9 (2). 1 - Each Party shall report annually on the steps taken to implement this Protocol. Such reports shall include notifications made in accordance with Article 13 (3), contingency plans established in accordance with Article 15 and any other notifications and information called for pursuant to this Protocol for which there is no other provision concerning the circulation and exchange of information. 2 - Reports made in accordance with paragraph 1 above shall be circulated to all Parties and to the Committee, considered at the next Antarctic Treaty Consultative Meeting, and made publicly available. If a dispute arises concerning the interpretation or application of this Protocol, the parties to the dispute shall, at the request of any one of them, consult among themselves as soon as possible with a view to having the dispute resolved by negotiation, inquiry, mediation, conciliation, arbitration, judicial settlement or other . which the parties to the dispute agree. 2 - A declaration made under paragraph 1 above shall not affect the operation of Article 18 and Article 20 (2). 3 - A Party which has not made a declaration under paragraph 1 above or in respect of which a declaration is no longer in force shall be deemed to have accepted the competence of the Arbitral Tribunal. 4 - If the parties to a dispute have accepted the same means for the settlement of a dispute, the dispute may be submitted only to that procedure, unless the parties otherwise agree. 5 - If the parties to a dispute have not accepted the same means for the settlement of a dispute, or if they have both accepted both means, the dispute may be submitted only to the Arbitral Tribunal, unless the parties otherwise agree. 6 - A declaration made under paragraph 1 above shall remain in force until it expires in accordance with its terms or until three months after written notice of revocation has been deposited with the Depositary. 7 - A new declaration, a notice of revocation or the expiry of a declaration shall not in any way affect proceedings pending before the International Court of Justice or the Arbitral Tribunal, unless the parties to the dispute otherwise agree. 8 - Declarations and notices referred to in this Article shall be deposited with the Depositary who shall transmit copies thereof to all Parties. 1 - If the parties to a dispute concerning the interpretation or application of Articles 7, 8 or 15 or, except to the extent that an Annex provides otherwise, the provisions of any Annex or, insofar as it relates to these Articles and provisions, Article 13, have not agreed on a means for resolving it within 12 months of the request for consultation pursuant to Article 18, the dispute shall be referred, at the request of any party to the dispute, for settlement in accordance with the procedure determined by Article 19 (4) and (5). 2 - The Arbitral Tribunal shall not be competent to decide or rule upon any matter within the scope of Article IV of the Antarctic Treaty. In addition, nothing in this Protocol shall be interpreted as conferring competence or jurisdiction on the International Court of Justice or any other tribunal established for the purpose of settling disputes between Parties to decide or otherwise rule upon any matter within the scope of Article IV of the Antarctic Treaty. 1 - This Protocol is subject to ratification, acceptance or approval by signatory States. 2 - After the 3rd of October 1992 this Protocol shall be open for accession by any State which is a Contracting Party to the Antarctic Treaty. 3 - Instruments of ratification, acceptance, approval or accession shall be deposited with the Government of the United States of America, hereby designated as the Depository. 4 - After the date on which this Protocol has entered into force, the Antarctic Treaty Consultative Parties shall not act upon a notification regarding the entitlement of a Contracting Party to the Antarctic Treaty to appoint representatives to participate in Antarctic Treaty Consultative Meetings in accordance with Article IX (2) of the Antarctic Treaty unless that Contracting Party has first ratified, accepted, approved or acceded to this Protocol. 1 - This Protocol shall enter into force on the thirtieth day following the date of deposit of instruments of ratification, acceptance, approval or accession by all States which are Antarctic Treaty Consultative Parties at the date on which this Protocol is adopted. 2 - For each Contracting Party to the Antarctic Treaty which, subsequent to the date of entry into force of this Protocol, deposits an instrument of ratification, acceptance, approval or accession, this Protocol shall enter into force on the thirtieth day following such deposit. Reservations to this Protocol shall not be permitted. 1 - Without prejudice to the provisions of Article 9, this Protocol may be modified or amended at any time in accordance with the procedures set forth in Article XII (1) (a) and (b) of the Antarctic Treaty. 2 - If, after the expiration of 50 years from the date of entry into force of this Protocol, any of the Antarctic Treaty Consultative Parties so requests by a communication addressed to the Depositary, a conference shall be held as soon as practicable to review the operation of this Protocol. 3 - A modification or amendment proposed at any Review Conference called pursuant to paragraph 2 above shall be adopted by a majority of the Parties, including three-quarters of the States which are Antarctic Treaty Consultative Parties at the time of adoption of this Protocol. 4 - A modification or amendment adopted pursuant to paragraph 3 above shall enter into force upon ratification, acceptance, approval or accession by three-quarters of the Antarctic Treaty Consultative Parties, including ratification, acceptance, approval or accession by all States which are Antarctic Treaty Consultative Parties at the time of adoption of this Protocol. (a) With respect to Article 7. the prohibition on Antarctic mineral resource activities contained therein shall continue unless there is in force a binding legal regime on Antarctic mineral resource activities that includes an agreed means for determining whether, and if so, under which conditions, any such activities would be acceptable. This regime shall fully safeguard the interests of all States referred to in Article IV of the Antarctic Treaty and apply the principles thereof. Therefore, if a modification or amendment to Article 7 is proposed at a Review Conference referred to in paragraph 2 above, it shall include such a binding legal regime. (b) If any such modification or amendment has not entered into force within 3 years of the date of its adoption, any Party may at any time thereafter notify to the Depositary of its withdrawal from the Protocol, and such withdrawal shall take effect 2 years after receipt of the notification by the Depositary. (e) any notification received pursuant to Article 25 (5) (b). 1 - This Protocol, done in the English, French, Russian and Spanish languages, each version being equally authentic, shall be deposited in the archives of the Government of the United States of America, which shall transmit duly certified copies thereof to all Contracting Parties to the Antarctic Treaty. 2 - This Protocol shall be registered by the Depositary pursuant to Article 102 of the Charter of the United Nations.